I am using the circuit below to monitor the output of a piezoelectric diaphragm, represented by a sine wave generator and capacitor C3. The circuit is powered from a split supply (+5V/-5V) derived from a linear power supply (230V, 50Hz). I need the full rail-to-rail dynamic range (or as close as possible). 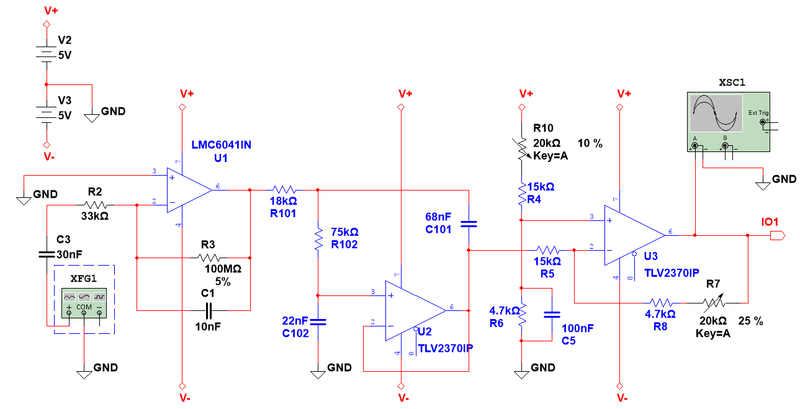 U3 - scale and bias amplifier to convert U2 output to 0V min, +3V max, suitable for ADC. The circuit works in simulation, but in practice I find that a high amplitude mechanical impulse on the piezoelectric disk causes U3 to oscillate'. (U3 seems to output the input plus narrow pulses which jump to the +5V rail at a frequency of 50Hz). The oscillation will eventually disappear (after about 30-40 seconds) if the piezo is left untouched. I checked the power supply rails - they are clean with little ripple, even when the oscillation is happening. If I disconnect U3 and monitor the output of U2 only, the problem is not present. I found that I could "cure" the oscillation in the circuit by putting a voltage follower amplifier between U2 and U3 and then reconnecting U3. I'd prefer not to use a voltage follower op amp as it introduces additional noise. My question is: Does U3 cause a problem for the stability of U2 at high frequencies? The impedance of C101 will be low for a high frequency impulse on the piezo disk and U2 is trying to drive current to support this as well as maintaining the correct current through R5 to keep the input voltages on pin 2 at around 1V d.c.
Perhaps there's a better way to offset the output signal? Browse other questions tagged sallen-key or ask your own question. Input impedance of low pass filter on LTspice must be constant in it's pass band?